All-metal, downward-pressure type, constructed with interlocking rack and round gears. 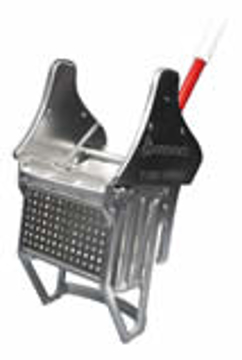 Put your buckets back into service with this high-quality side press wringer. Fits Rubbermaid, Contico, and White mop buckets. Engineered for maximum efficiency and durability. Plastic construction will not rust. Solid one piece tubular steel handle for durability. Handle is angled to allow maximum transfer of torque to the wringer panels to remove all excess water. High-efficiency wringer lasts 29 times longer than comparable wringers; tested to exceed 25,000 wringing cycles. Ergonomic handle reduces stress on wrist.